I started with the sketch from Stamping 411 and then when I saw this photo at Drunken Stampers Challenge I immediately thought of these papers and this stamp set. I like the outdoorsy feel that the Square Lattice embossing fold gives to the backdrop for my stamped butterflies. Supplies: 4" X 5 1/2" Crumb Cake card blank, Papers: SU-Crumb Cake, Peach Parfait, Pear Pizzazz, Designer Series Paper Paisley Petals, Naturals Ivory, Stamp: Strength & Hope, Ink: SU-Crumb Cake, Peach Parfait, Pear Pizzazz, Crumb Cake marker, Textured Impressions Square Lattice embossing folder, SU Punches-Word Window, Modern Label, ribbon unknown, SU dimensionals. Great interpretation Beverly!! Love all the fabulous colors you've used. absolutely gorgeous card and what a super color combo! Gorgeous card...love the colors! Thanks for playing along with Stamping 411! 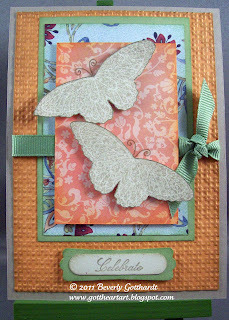 Oh, I like that embossing as well and it does work perfectly with the butterflies. This is a lovely card you've made, beautiful colors and a striking design! Very apropos for the longest day of the year! I love the mix of colors and textures. It's very nice! This is oh so beautiful!